In Bend you hike to your own mailbox, so it’s no surprise that hikes often get creative. 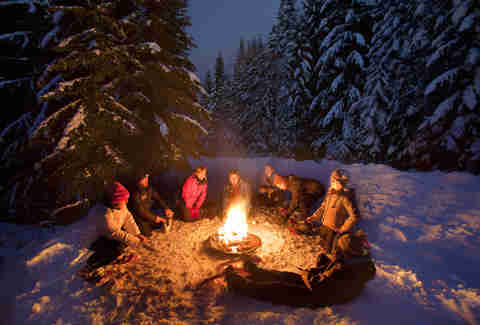 One unique local jaunt: A nighttime snowshoe stroll to a hand-carved snow-covered amphitheater where you are greeted by a bonfire and cups of hazelnut espresso vodka. 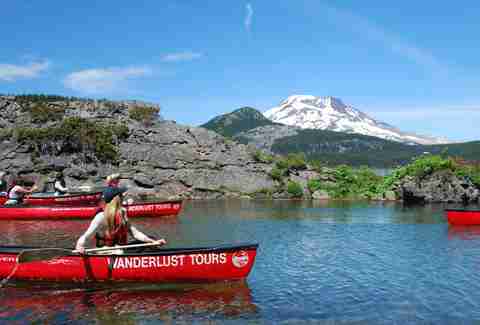 It’s pretty much the PNW equivalent of taking a dip in an Icelandic hot spring. You’ll truly feel one with nature as you’re sure to hear ambiguous animal calls while you learn fruitful facts about trees from a respected guide. Snowshoes are provided by Wanderlust tours. Chicago has deep-dish pizza, Portland has donuts shaped like male genitalia, and Bend has the ocean roll. Dubbed a cinnamon roll with a hell of a lot more personality, the Sparrow Bakery’s ocean roll is a luxury item around town. It’s made from traditional croissant dough, but the bakery swaps cinnamon with cardamom as its central flavor. If you want to snag one of these bad boys, you’ll have to claim yours early. They’re made fresh each morning and are top sellers. Think Harry Potter books during midnight release parties. It’s true that Bend is well-known for its world-class Bend Ale Trail beer tour of the city, which you can take via a van or a horse-drawn carriage (it’s also the largest beer trail in the West). And let’s face it: If you’re going to spend a weekend in Bend, you’re going to drink beer and you're going to want to do it with a view. 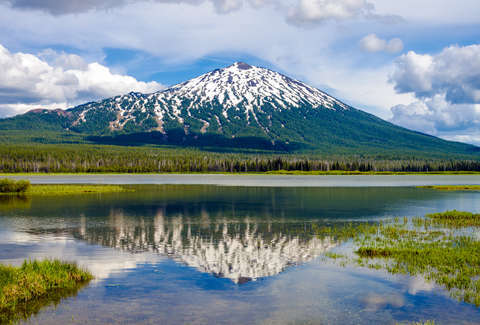 So the best way to kill 10 birds with one stone is to sign up for a Brews and Views Canoe Tour, which allows you to paddle through the Cascade Lakes, sip on some local hops, and get wet. And by get wet, we’re talking about getting in the water, and are in no way referring to that IPA you’re sure to spill all over yourself as you try to paddle like Burt Reynolds in Deliverance. Much like beer, independent coffee brewers are not confined to the larger metropoli within the Pacific Northwest. Lone Pine Coffee Roasters is Bend’s premiere 100% small-batch bean roaster, with products trickling into most notable local businesses around town. Pro tip: Show up earlier in the day and claim that ocean roll if you missed it earlier. Lone Pine is a carrier. Just 26 miles east of Bend, you experience the majesty of flight not crammed in a middle seat. Generally speaking, there aren’t many locations that are ideal for paragliding, but Pine Mountain includes all the fixings for a successful romp, including an altitude of 6,407 feet, desert thermal conditions, 15 launches, and a scenic, faultless climate for paragliding -- as long as you’re not attempting it midday. If you’re looking for a view of central Oregon that is above and beyond everybody else’s, this is literally your go-to solution. With over 70 parks, 40 lakes, and mountain ranges that are as high-maintenance as your Australian Shepherd, Bendites prefer to spend as much of their time outside as possible. But let’s be real: Tents are freezing in the morning and kind of wet. The solution: Ramblin’ Vans. 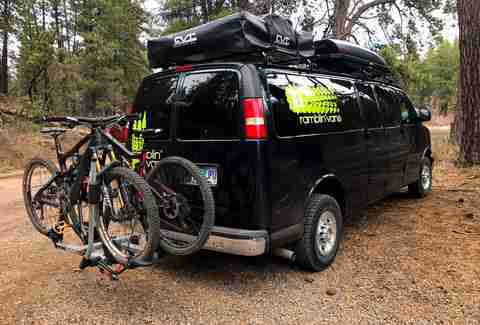 Ramblin’ Vans are spacious mobile hotel rooms that allow whole families shelter from both mosquitoes and Airbnb cleaning fees. When Bend began to soar to fame back in the '90s after building up a solid Yelp map of breweries, it remembered the little people. And by little people, we’re talking dogs. With so many parks and hiking trails, there are plenty that allow off-leash dogs, including Mt. Bachelor, which offers its own dog park. But while you’re day tripping in your Ramblin' Van, you might not want your dog stenching up your sleeping area. Instead, you’ll want to admit it to one of Bend’s boutique doggy daycare facilities, such as Dancin Woofs. Woofs includes luxury items like splash pools, chew toys, fresh water on tap, and central Oregon’s leading dog training expert. 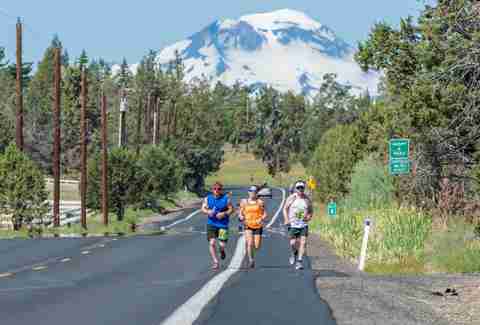 Beer bellies are impossible in Bend, as evidenced by the Bend Beer Chase. This race, which has runners trek 50 miles with beer stops along the final “Keg Leg” stretch, ensures that you get tipsy and don’t do something you regret. If you want an easier, year-round sprint in America’s trail running capital, you’ll want to head to the Deschutes River Trail. And if you haven’t caught on yet, the Bend mantra appears to be: We can do anything (read: extreme sport), as long as there’s beer! Did we mention that when you get to Bend, you’re probably going to drink a lot of beer? Top Oregon brews, such as Deschutes (Home of the Red Chair IPA), 10 Barrel, and Boneyard are all stationed out of Bend. This means you’ll need pizza at some point, and you’ll need pizza fast. Your best bet: Pizza Mondo, the place that combines thin, gooey New York-style crust with a dough that’s ridiculously tasty and made on the premises. Named for Phil Meglasson, a local who cared a lot about XC mountain biking, Phil’s Trail holds some key advantages for any pedaling pro. Namely, the whole trail is downhill. You’ll know you’re on the right path if you circle Phil’s famous “flaming chicken,” which is an erected pike with a tacky plastic chicken that is depicted to be on fire. The chicken is a local muse, typically dressed or painted differently depending on the season. And if you don’t personally mountain bike, you can still catch sight of the flaming chicken through one of Bend’s Art Safari Tours. Cider may never be the new beer, as hops tend to be the central bloodline between all major Oregon cities, red or blue. Still, Bend is the home of Atlas Cider Company, which takes fruit ciders as seriously as most of us take wearing clothes to work. 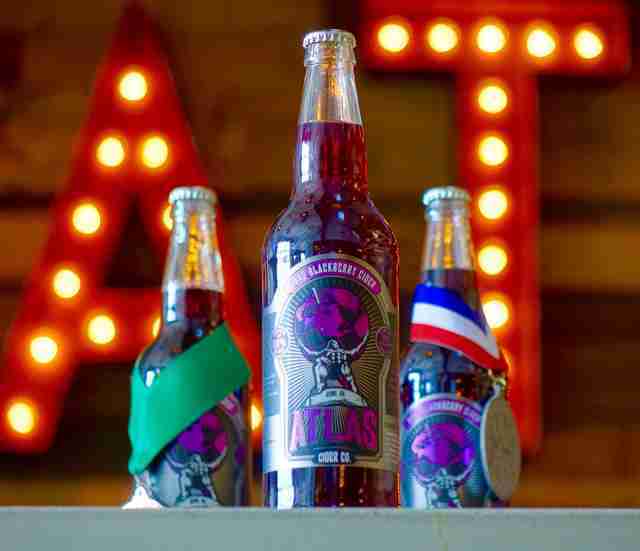 Considered by many to be Oregon’s state cider, Atlas’s blackberry is naturally gluten free -- like all of their products -- and primed from locally sourced Northwest fruit. This particular beverage is plenty sugary, which may be a turnoff for some, but beer lovers harp on its curated tang like a toddler swapping milk for apple juice. At Mt. 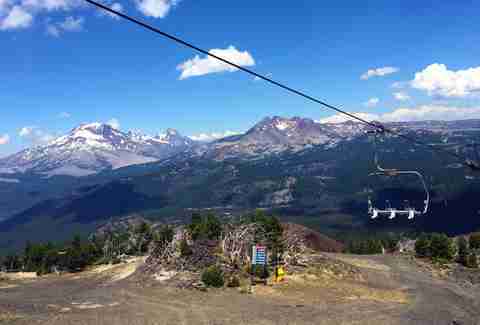 Bachelor, scenic chairlift rides top your daily itinerary. Launching you through rows of flashing evergreens, you travel from the West Village base area to the Pine Mountain Lodge. 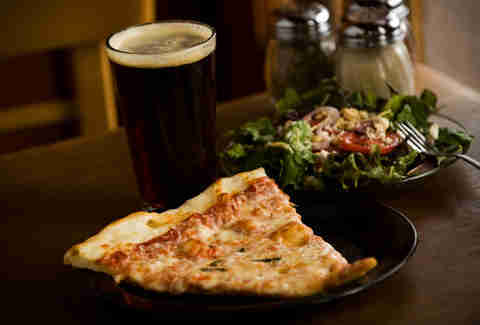 From there, you are introduced to the usual suspects: food, brews, hiking trails, and disc golf naturally. If there’s one thing locals wish was still a secret, it’s Rockin’ Dave’s Bistro. With a cocktail list as long as its brunch menu, the quirky breakfast staple has become a tourist attraction with its fanciful vegan bagel sandwiches and build your own breakfast burritos. Dave’s also frequently features very, very good live music. If you have no idea what this means, imagine the Tour de France in the United States. The BMC Cascade Cycling Classic features most of North America’s top cyclists and teams and has them race around the epic Mt. Bachelor. The six-day event plays with seven racing “stages” and a profound cornucopia of scenic viewpoints. Four of these days are open to amateurs, so you might want to take some initiative and order some spandex. We know what you’re thinking: All this talk about beer and blackberry cider, but nothing for the oenophiles? Well, there’s plenty for oenophiles, winos, and your everyday drinking buddy who has no idea about wines. Thirty different 2-ounce tasters from 600 labels that you can test without even spending a dime, to be exact. Bringing people in with their lack of fees (zero, actually), The Wine Shop and Beer Tasting Bar has become a fixture in Bend over the last decade, priding itself over a rare wine list, an extensive display of charcuterie and cheese, as well as, you know, beers, duh. Jack Rushall is a Portland-based freelance writer for Thrillist, MUNCHIES and The Washington Post. He likes to open windows. You can follow him on Instagram @fromrushallwlove.